Did you try to disable Microsoft Edge? But failed so many times? Don’t worry we are here to help you with this article. Go through it and have a clear idea about how to disable Microsoft edge successfully. You may find it difficult to disable Microsoft Edge if you are not tech-savvy. The browser Microsoft Edge is an embedded program of the Windows operating system. You just can’t remove the program in some random manner. Whenever you intend to uninstall the Microsoft Edge, annoyingly a pop-up message may appear on your screen. As a matter of fact, you can disable the Microsoft Edge browser. Follow the guidelines below and disable the Microsoft Edge successfully. The DIY hacks given here are useful and workable as well. But proceeding with a wrong step can cause harm to your computer. If you don’t have advanced computing knowledge, please seek help from the experts. You can easily contact the experts available at Microsoft Support portal. The Baba Support technicians are smart and have vast computing knowledge along with years of experience in this field. You can avail their service by dialing the Technical Support phone number For Microsoft. I have added the best disabling process in my article. Give it a try and disable Edge easily. At first, click on the icon This PC on your desktop. Now open Windows and then SystemApps. Highlight the Microsoft.MicrosoftEdge_8wekyb3d8bbwe folder then. 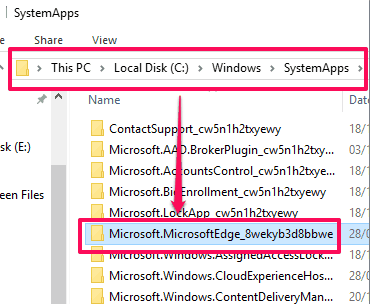 Next, right-click on Microsoft.MicrosoftEdge_8wekyb3d8bbwe folder and click on the option Rename. Rename it as per your choice. There you go! Your Microsoft Edge browser must be disabled now. If you change your mind someday and want your Edge back, just Rename the folder again. Set the previous name as the folder name. You will get your Edge back. Want to completely uninstall your Edge Browser? I can help you through. Follow my complete guide on uninstalling Microsoft Edge. Press the Windows logo key+S button at a time on your keyboard. Now type Powershell and click on the option Windows Powershell. Then a pop up blue window will appear on your screen. Type get-appxpackage *edge* in that window. If you are sure that there is no typo, press the Enter button then on your keyboard. Now, detailed location of your Microsoft Edge will be visible on your screen. You need to type remove-appx package in the Powershell window next. Then hit the Space button on your keyboard. Now you have to copy the address next to the item PackageFullName and paste it after the command remove-appx package. Followed all the steps properly? Then your PC must be free from Microsoft Edge Browser. But there are times when users report that after uninstalling the Microsoft Edge Browser they face different problems. When you uninstall any application, in some cases, still some temporary files stick to your computer. And that’s the main reason behind the problem you face. Visit the Support Portal and talk to the support executives about the issue. They will you guide you through the fixes easily. Hope the article helped you to uninstall Microsoft Edge. Wrapping up we must say seeking experts’ help to fix any issue you face in your computer is the best possible way. It is time-saving and safe for your PC as well. The Microsoft Support executives at Baba Support are always available at your service. Dial the Customer Support number +18009170185 and talk with experts to fix any problem.